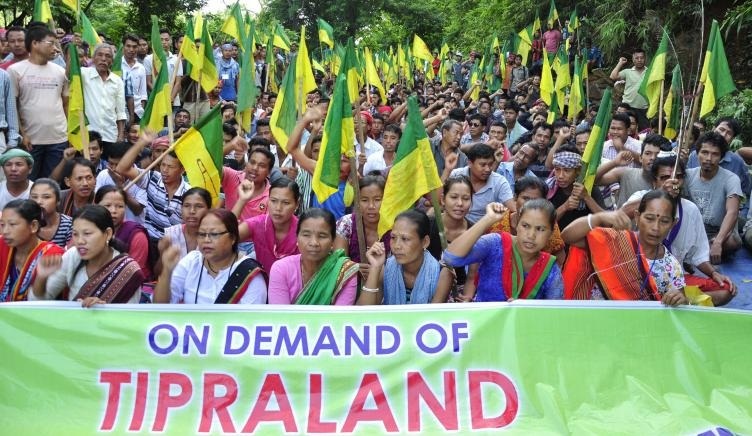 The Indigenous People’s Front of Tripura (IPFT ), will join the national convention and demonstration of National Federation for New States (NFNS) in New Delhi to demand for a separate land for tribals in Tripura. A 23-member delegation headed by IPFT president and state revenue minister NC Debbarma and the party’s general secretary and tribal welfare minister Mevar Kumar Jamatia will attend the convention till November 15. As part of the programme, 30 political parties and organizations demanding separate states in different parts of the country will take out a demonstration at Jantar Mantar. IPFT leaders said here on Friday that the party has been in NFNS since the very beginning, pressing their core agenda to get a separate Twipraland for tribals. The party itself came into existence in 1999 to pursue the demand in view of the steady decline of tribal population in the state, they said. Tribals were the majority here till 1951 but now are the minority, reports TOI. Supporting the demand made by opposition party Indigenous Nationalist Party of Twipra to have an NRC in Tripura, IPFT leaders said this is necessary for the protection of the interests of the tribal population.